Pumping iron at this gym could make you into much more than a fitness freak. Click here to play! 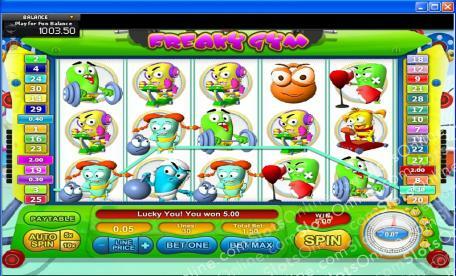 Spin the reels to exercise your way to plenty of cold, hard cash! This game will have you performing every fitness task in the books to collect a fortune. Twist it out for a cardio ab workout. This instructor holds a top payout work up to 3000 times your line bet if you can spin two or more across an active payline. Try your hand at jump roping, as this symbol will gain up to 1500 times your line bet. If running is more your thing, don’t worry as the treadmill symbol will bring in up to 500 times your line bet. There are plenty more activities to keep you fit and rich. This includes weight lifting, boxing, cycling, and karate to name a few. There are also plenty of bonuses to keep you coming back to this gym. Spin three or more bonus stopwatches on an active payline to trigger the ‘Kids Power’ bonus game. There is also a hula-hoop scatter symbol that will trigger a number of free spins if you can line her up anywhere on the board. Don’t forget about the weighted balls. These can add up to a hefty payout indeed as they are multipliers. Finally, this game features an automatic payout after 60 spins, meaning that you can always win on this game. Get to the Freaky Gym to work it out for your chance at plenty of cash prizes. The hula-hoop girl is a scatter. If you spin three or more anywhere on the board, you will trigger a number of free spins. Spin three or more bonus stopwatches across an active payline to trigger the Kids Power bonus feature. You will get to choose from three competitors to perform their exercise. The longer they perform their task, the more your bonus payout will be.